BROWN, Agnes L. “Aggie” (Santosuosso), of Quincy, originally from Dorchester, passed away at Grove Manor Estates, after a brief illness, surrounded by her loving family on January 17, 2019 at the age of 95. Born and raised in Dorchester, Agnes graduated from Dorchester High School.During WWII she worked at the Fore River Shipyard in Quincy. 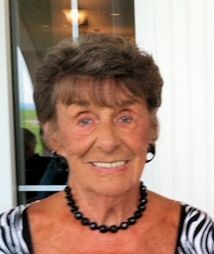 Agnes was a long time poll worker for the City of Quincy. In her free time she was an avid reader, loved music and enjoyed a good Manhattan. A devoted wife, mother, sister, grandmother and friend, Agnes will be greatly missed by all who were blessed to have known her. Agnes was the wife of the late Joseph E. Brown. Loving mother of Deborah J. Haas and her husband Glenn of E. Weymouth, Joseph M. Brown of Bridgewater and the late Daniel J. Brown. Devoted sister of Alfred Santosuosso of Braintree, Therese Macdermott of Holbrook and the late Ernest Santosuosso, Benjamin Santosuosso and Peggy Collins. Also survived by 10 grandchildren, 11 great grandchildren and many nieces and nephews. Relatives and friends are respectfully invited to attend visiting hours on Monday, January 21st, from 5:00 – 7:00 PM in the Cartwright-Venuti Funeral Home, 845 Washington St., Braintree. A Funeral Mass will be Celebrated on Tuesday, January 22nd at 10:30 AM in St. Francis of Assisi Church, Braintree. Burial will follow in Pine Hill Cemetery, Quincy. Should friends desire, memorial contributions may be made in her name to the American Heart Association, 300 5th Avenue, Suite 6, Waltham, MA 02451.